The perfect sock which allows you to perform to your absolute limits. 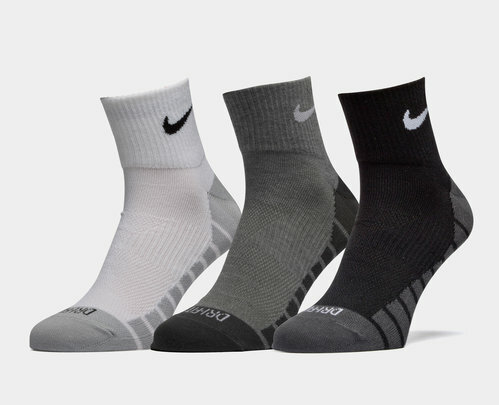 Get ready for the action and pull on these Nike Dry Lightweight Quarter Training Socks 3 Pairs in Multi colour options. This 3 pack of training socks are able to combine traction, cushioning and ventilation all in one, everything you need for high-intensity training. Underneath Nike has engineered yarn that offers increased transaction to help keep your foot in place. Specifically placed cushioning help prevent pressure coming from your laces and ventilation where it matters most. Made from nylon, polyester and elastane, the dynamic arch compression offers targeted support and the quarter length design provides a good balance between no-show and mid-length socks, to suit your needs.